Very Rev. John J. Considine, M.M. A GIRL IN A BOARDING SCHOOL in Kansas wrote to me recently that her teacher told her to ask me what reading I liked during high school days. I recognized the letter immediately as' an item in that program of forced labor which teachers are required to impose upon the reluctant young, one of those hurdles along the highway to matriculation that every girl must gracefully leap to grasp her sheepskin. Could I truthfully answer Mary Ellen, I asked myself, and yet tell her something which Sister would regard as helpful? There was that Gmustark and Beverley of Graustark period when I feverishly read two novels a week from the public library. Perhaps I had better not mention that, though I have a suspicion that it accomplished something for me, entirely unrealized at the time. It provided an era of muchness in the book field, like meeting many, many new people every day. The kaleidoscope of scenes and characters which rapidly bowed in and out of my mind probably whetted my imagination and gave me a fullness of ideas, thin and tawdry though they were, which led me to undertake unhesitatingly to scribble off with the greatest of ease a fat weekly column in a local newspaper. "Are you the author of that column in the News?" asked Sister Rose, one of my teachers at Holy Family High. "Oh, I guess so," I replied, squirming and uncomfortably anxious to move along, since I realized that while there was quantity in the column there was little of quality that would draw a Placet from a teacher. I decided to tell Mary Ellen about more careful periods, marked by two activities which probably did me some good. One was the period of the abstracts. The abstracts were a piece of drudgery imposed in school, but which, secretly and without confessing the terrible fact to a soul, I enjoyed immensely. We were required to read such books as Ivanhoe, Kenilworth, Oliver Twist, David Copperfield and prepare a plot summary and character analysis as we went along, with a selection of choice passages and a recording of whatever reflections came into our youngish heads. As I say, I enjoyed this immensely. Without realizing it at the time, the deep absorption in each volume led me to think less of plots and more and more of the author's power of expression. One of the books which caught me completely in its toils was Lorna Doone and as I look back on it, it was the beauty of atmosphere that it created which meant the most to me. Thirty years later, I find that the memory of Lorna or of John Ridd do not mean much to me; rather it is the charm of the Doone country, which, through Blackmore's hypnotic use of words, drew me so absorbingly and reflectingly into its recesses. very helpful in giving me an appreciation of words, though I never became a poet. During my poetry year in English class, I took to the woods and sat by babbling brooks a number of times to turn out products for Sister Ricardia. I felt much more satisfaction, however, in reading poetry than writing it. Perhaps Mary Ellen will take up the Bartlett habit and get much farther with it. At Maryknoll, the late Bishop James Anthony Walsh exercised great influence on all of us in the college English class. He was a sensitive man but an eminently practical one and his great theme was simplicity, frugality and selectivity in the use of words. Our assignment was usually the writing of a two hundred word descriptive item or editorial and under the impetus of his searching criticisms we found ourselves chiseling these pieces with all the devotion of a sculptor working his marble. Sometimes we kept for weeks on a single morsel, in the hope that at the end there would be the reward of seeing it accepted for a place in The Field Afar. It was Bishop Walsh's high standards that won his magazine so much esteem among many who were not particularly devoted to missions but greatly devoted to good writing. Writing, however, is a hollow, puny activity without interior experiences to give it substance. I found that I had no particular gift for words, that I had no faculty for weaving gossamer webs of delicate beauty out of thin air. Unless something happened in my life my writing was finished. But I was in a field in which things were almost bound to happen. Missionary circles carryon in terms of continents and lo! I suddenly found myself catapulted from the gentle, smiling hill country of the Hudson Valley to Rome, the heart of Christendom. The urge to write came back as throngs from every corner of the earth surged through the corridors of the Vatican Missionary Exposition of 1925. The result was a book published by Macmillan, The Vatican Missionary Exposition, a Window on the World. At the close of the Holy Year, the authorities of the Sacred Congregation of the Propaganda in their hunt for workers for their'research department hit upon me and for twelve months or so I partook of the concentrated essence of missionary data. I dealt in particular with statistics, a providential thing because it transferred me from the field of fanciful flights to the dry-as-bones realities of exact analysis. I came to know the name and location of practically everyone of the five hundred and more mission territories throughout the earth and could give a passingly good description of the outstanding characteristics of each as known to the Holy See. At the end of the year my collection of figures was published by the Vatican Press as a routine volume in Latin, Missiones Catholicae. For the next ten years I had a part time assignment to help prepare Propaganda statistics for publication. Our most ambitious project appeared in 1935, under the Italian title, Guida delle Missioni Cattoliche, a volume of over a thousand pages. In 1927 a novel project for Rome came into being, a missionary news service. Since I was conveniently at hand, I was given the task of organizing it. Advice came from many sources including American friends in the Associated Press, Mr. Thomas B. Morgan of the United Press, and counsellors in Rome, Paris, Munich, London, and the United States. Mr. Justin McGrath, Frank Hall's predecessor of the N.C.W.C. News Service in Washington, was particularly kind. Fides Service-for this was the organization's name-soon had spread its tentacles over Asia, Africa, and the far corners of the earth. We received our material principally by mail, supplemented by a small wire service from the leading cities of Asia. While we never attained perfect coverage of the world field, we strove desperately to achieve this ideal and certainly received billowing rivers of data over which we had to labor tirelessly from eight each morning until sometimes late at night extracting pay dirt. Witing at Fides Service became a matter of yardage. We were divided into five departments according to language, English, French, German, Italian, Spanish, and we were separately responsible to each country in the world where our particular language was current. Thus to the English language department fell the United States, English Canada, England, Ireland, Scotland, Australia, New Zealand, the Philippines, India, South Africa, and the British colonies. Much of the material was useful in all countrics but every week there were stories which required treatment according to the special interests of one or other nation. Under the pressure of meeting deadlines, fine writing was usually out of the question. I expericnced constantly a scnse of failure in this regard. There was the handicap of working in an atmosphere of foreign languages because very few missioners were English-speaking and it was a question of using French, Italian, Spanish, and German manuscripts, of talking most of the day in Italian or French and then sitting down to a typewriter to strike off copy in English. But there was the thrill and inspiration of great happenings which constantly stirred us. At Fides Service we really lived; we felt the pulse of great events, both in Rome and throughout the outer world. The years with Fides Service wcre a very satisfying cxperience. There were a number of journeys, some in Europe and some to other continents. I went with the Papal Mission to Ethiopia and in the 1930's I was sent by Fides Service on a voyage of about a year and a half across Asia from Palestine to Japan, then to the East Indies and finally across Central Africa from the East Coast to the West and thence back across the Sahara to North Africa and Rome. The expenses of this expedition were paid by a series of articles which I prepared as I journeyed for agencies in seven different countries. Upon returning to Rome I was quite dismayed to realize ho'W poorly these stories were written. It was only after returning to the United States that I was able to arrange for a few tranquil hours each week to cast my huge gatherings of material into a book. This became Across a World. Tom Kernan was the mentor of this work and under his disciplined guidance I was required to avoid the slovenliness of haste. Since returning to America I was also required to prepare a biography of Maryknoll's bandit victim, Father Jerry Donovan. This has appeared under the title When the Sorghum. was High. In this case I chose Katherine Burton as mentor. I can speak from experience of the value of such a manuscript umpire, a warden to protect the writer from the pitfalls of subjectivism. Writing, I can assure Mary Ellen and all other members of high school English classes, is for most mortals an arduous and disillusioning task. It means patient years spent seeking to draw from the treasuries of the literary great. Most of us, however hard we try, acquire lamentably little from the masters. It means, further, meeting up with rich and moving experiences of life, the great teacher. Even with more than an ordinary share of good fortune, we end by concluding that we have proven decidedly unprofitable servants. EDITOR'S NOTE: Father Considine was born in New Bedford, Mass., in 1897, entered Maryknoll in 1915 and was ordained in 1923. 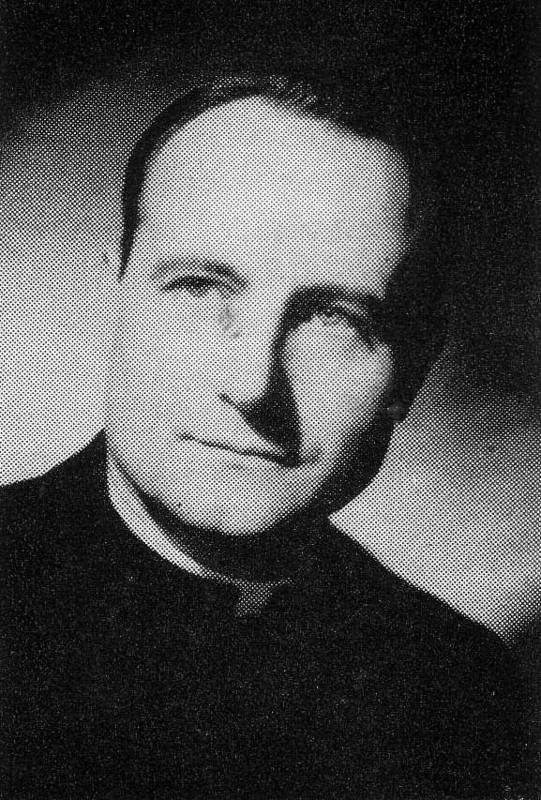 He became Vicar General of Maryknoll in 1943. His books include THe Vatican Mission Exposition, 1925, Macmillan; When the Sorghum Was High, 1940 Longmans; Across a World, 1942, Longmans; March Into Tomorrow, 1942, Field Afar Press.